If you had discovered the secret to happiness early in life, what would your life could be like right now? What if you had made a few different decisions along the way? Could you be famous or more well known? Richer or more successful? Healthier and more beautiful -- beautiful inside? Would you be with different people who might have steered you in the right direction? Would you be reaching for your dreams or stabbing at falling stars . . . stars that fizzle into oblivion? A friend of mine went to a ten-year reunion and caught up with two dear, old friends from high school. These were amazing friends whom she expected might change the world in some way. How shocked she was when she met them again, after ten years. One looked younger -- as if she hadn't aged a day since her senior prom -- and the other looked twenty years older, tired and dull in the eyes. As she got to know them again, and teased out their stories, she understood why, and learned a powerful lesson that she related to me. Let me share it with you. One friend had become very successful, happy and fulfilled. The other hadn't accomplished much of anything, she had confessed in dismay. The happy woman had discovered certain key truths and learned a powerful lesson or two over the years. She had stumbled upon the secret to happiness . . . luckily. On the other hand, the tired, nervous woman seemed lost and unsure of herself, and had gravitated from one folly to another, without ever finding her way home. She was adrift in confusion, and so unhappy, that she had tried every drug "under the sun", she had confessed to my friend, experimenting with open marriage, leaning on drugs and alcohol, and chasing the "wrong dreams," for far too long. "I have a knack for spotting a rainbow," she told my friend, "but it always turns out to be a tarnished rainbow, that slips through my hands." This is surely the story of two women who followed different paths in life. One found the secret to happiness, and the other found unhappiness, failure and desperation. The story illustrates the problem with doing things that will not really lead to true and lasting contentment. But, how do you know what works and what doesn't? And, with so many pundits and know-it-alls in our culture telling you how to live, and supplying you with easy, formulaic answers, how do you know who to believe? My father once told me the secret to happiness was to follow a sure path and avoid risk. Guess what? That turned out to be wrong. Or mostly wrong. My father is a good man, and an intelligent one, a man with many talents, but he was wrong -- wrong quite often, as we all are. Yes, it is human to err. All of us grow up thinking we know the answers. Maybe the answer is rebelling against our parents or doing the opposite of what other folks do. Or, maybe the truth lies in doing what your told, and believing everything an authority figure says. Some say it's money. Others say family or a good job. Religion. Science. The debate goes on. Others will tell you that there are no answers, and you've simply got to figure it out for yourself, if you're lucky. Well, I have good news for you. There are answers. Or at least there are quite a few. I'm talking about answers that have been worked out in the research that positive psychology has done in recent years. They've put the old myths and assumptions to test, to find out what really makes people happy and keeps them that way. They've removed the guesswork, hearsay and supposition from the secret to happiness. Just because something has always been done a certain way, or an idea has been assumed to be right, makes no difference when you analyze the results. Thousands of happy people have been studied, and thousands of unhappy people. Scientific analysis has been applied, and a host of powerful principles and truths have been identified. Anyone who sincerely wants to be happy should learn about the results. Yes, practically anyone can claim the prize of peace, love and happiness, armed with this information! Yes, peace, love and happiness! The real rainbow, the untarnished one. That's why I wrote my eBook, The Secret to Happiness, because I wanted to expose the myths and misconceptions that abound in our culture, and help my clients get to the bottom of life's most fundamental questions. Based on modern research and scientific principles, plus my nearly 40 years of practice in the mental health field, The Secret to Happiness will give you the tools to realize your wildest dreams . . .
And put you on your way right now to building a trustworthy foundation for the kind of life you've always wanted. Also, the happiness research (what psychology calls the sense of well being research) continues, and new revelations are brought forth, from time to time. If you get my book, you will be entitled to receive all future revisions for free. So, you'll always be able to keep up with the latest news and insights coming from the social science community . . . because I try to revise on a regular basis. I'll make it easy for you by plowing through the technical jargon and tedious research reviews, boiling it all down to the essentials, the foundation of the secret to happiness. Why end up like a ship stranded at sea when you can find out what really makes you happy? If you're like most people, about half of what you know about happiness is correct, and the other half is pure myth. But just think what you could do if you knew what the scientific research says about happiness? What kind of difference could it make, in your life and in the lives of loved ones, if you knew the secret to heart stomping happiness? If you knew exactly what makes people happy and what doesn't? One advantage you'd have is the ability to live your life based upon a secure foundation . . . a proven foundation for success. And wouldn't you be able to make better decisions? Or get your priorities really clear and straight? Why, you'd have definite advantages in designing a life that would make you and your loved ones truly irresistibly and permanently happy. Free from worry and be confident in their approach to life (without enduring the anxiety of barking up the wrong tree). and may make them more unhappy or miserable in the long run! What's even sadder is seeing a misguided soul squander a lifetime by chasing a romantic dream (or series of dreams) that has no chance of leading to genuine happiness. There are lots of happiness busters and happiness mistakes in our world, and the book goes into how to avoid them and why. And show them how to conduct relationships that will help them to live longer, feel better and attain real happiness, peace and love. Especially important for younger people who haven't had time to learn from mistakes and experiences, and older folks who have labored under a false sense of security for years, the new research in happiness gives anyone the opportunity for a second chance...the chance to get it right this time. It's kind of like having a Near Death experience and seeing the light, getting your second chance. Learn how to stop making old mistakes and move forward in your quest for peace, love and happiness. If you know the right steps you can achieve your goal faster than others who follow one dead end trail after another. After finishing my second training on the science of happiness, years later, I conducted an immediate analysis of my own life, realizing I needed to make changes to improve my chances of bringing true happiness into my life. Oh, you can be sure, my life isn't perfect, and I have continued to make a few mistakes, but it's getting better all the time because I know where to aim now. And I worked with my clients on attracting greater happiness into their lives and finding practical ways to incorporate the secret to happiness into the fabric of their lives. As I followed their progress, I distilled from their information the most effective methods they used to improve their lives. A third training later in my career led to a deeper understanding of true happiness and even more changes in my priorities and behavior. I became passionate about happiness and helping people to attain it. One of my colleagues dubbed me the Happiness Guru, and suggested I write a book about how the average person can bring happiness into his life and keep it...forever. Here it is, for you to read, a page at a time, or in just a few minutes a day. ...and to getting what you want out of life. Save it on your device and refer to it whenever you need a little reminder or what to go deeper, solve a problem or open your heart to the healing power of a happy, optimistic mindset. The Happiness Prescription presented in my book is your answer to all the false info and materialistic hoopla that abounds in our culture about the nature of happiness and the human capacity for it. And, believe me, there is a bunch of crap floating around out there that promises you happiness but does not get you even close! You will not find my Happiness Prescription anywhere else because it is unique to my experience, my many years of professional experience as a therapist helping people to find solutions to their problems and making sense of the mistakes they've made. I've learned what works and what doesn't, and how to mine the hidden gold in the rubble of our mistakes, while never giving up on the human dream of living a great life and making a unique contribution to the lives of loved ones and the welfare of the world. The Secret to Happiness is what you've been searching for, if you want a master guide based on fact, rather than fantasy, as to what makes people happy. You'll find ANSWERS and clear, concise information that you can apply toward your happiness account in the here-and-now. What can I do to make myself happier right now? How can I leverage the happiness research findings toward my personal happiness and peace of mind in the long term? How to I build the life of my dreams and reach my full potential for peace, love and happiness? The happiness research truly amounts to the Fountain of Youth because it can assist you in living a longer, healthier life. Fact is . . .
like losing key relationships that you neglected while amassing your fortune consisting of this, that and the other. Yes, if you're happy...truly happy...you'll be sick less often and love your life more and add years to your life. Your immune system will be stronger and a strong sense of purpose will protect you like armor against disease and early death. 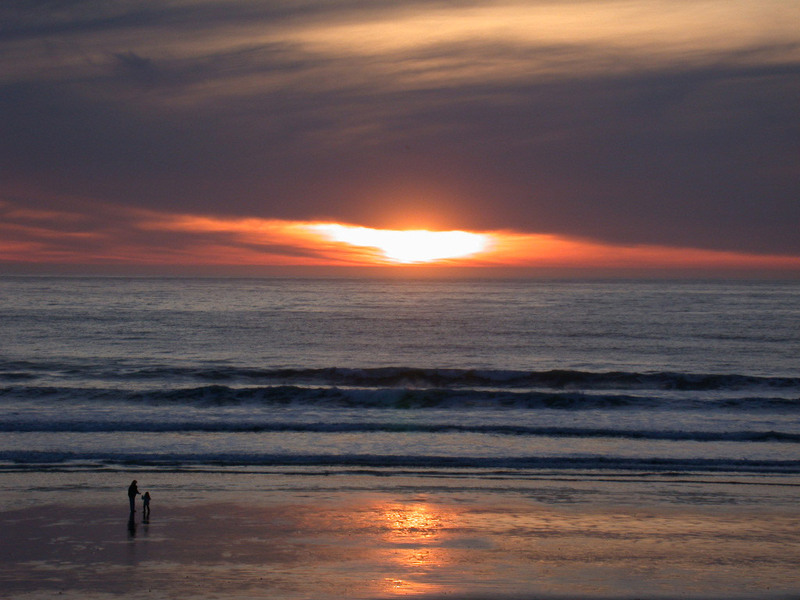 Given the enormity of so many happiness benefits, who would choose not to be happy? The problem is we don't realize we're deciding against happiness. ..we may think we're going to be happy...without the facts on happiness, without arming ourselves with up to date accurate info, we may just have to guess how to lead our lives. The Secret to Happiness will reveal the Happiness Prescription, and will take the guesswork out of designing a happy life. ...a research-based road map for finding life's buried treasure, within and without, and unleashing your special potential for happiness and genuine, lasting success . . .
Over time, as the years go by, it will be your trustworthy guide to love peace and happiness. Not a bad deal -- a package deal. The book will guide you in the art and science of making your happiness a reality, and not just a wishful dream, and reveal the keys to your lifelong success. I believe the Happiness literature ought to be required reading for high school and college students. And I wonder, can a person consider himself truly well educated if he has a poor grasp of the subject of happiness? Without a firm understanding of happiness, how can we conduct happy relationships? And how can anyone rely upon accident or chance to find or hopefully stumble upon the right ingredients to create happiness in his/her life? Without the secret to happiness, it's nothing more than a hit-or-miss proposition. Who Should Know the Keys to Happiness? Every teacher, leader, health care provider, every clergyman, coach or parent, every couple or newlywed couple should know what the research reveals about true, life-long happiness. Scout leaders and gurus, songwriters and speech makers need to know the facts and realities of happiness. Knowledge should inform craft. The truth should guide our lives. They say we only go around once, so that gives us one chance to get it right and make happiness happen for ourselves. Once chance to build a life that dreams are made of, and we can, by applying the happiness principles to our everyday lives. You'll know the importance of taking care of your relationships and giving others Unconditional Love. You won't have to live with regret or guilt . . . the guilt of having lived an unbalanced life in you later years. And, best of all, you'll be surrounded by loved ones who will be there for you when you need them -- loved ones who can make your life, right up to the final days, more meaningful, joyful, and eminently more livable . . . because you'll be applying the secret to happiness to your every day life. Peter L. "Richard, this happiness thing is for real, isn't it? There really is a happiness secret. And you know, I never dreamed I'd learn so many happiness tips in any one book. I like the fact that your book is not hard to read, and it's a quick read. Thanks for the brevity and the great ideas." Susan T "Thanks for straightening me out. I was going in the wrong direction until I found your keys to happiness." Steve D "I was skeptical at first, but you changed that fast. Never have I found so many helpful tips. Thanks for opening my eyes on how I am my own worst enemy when it comes to seeking what's good for me. I'm really shocked about a few things like so many of the world's richest people being the most unhappy! Guess I shoulda known that, huh? Thanks for opening my eyes...again." A recent trip to the local bookstore revealed numerous happiness books were for sale, and just about every one looked so long and windy, I doubted I'd ever read past the first chapter. The beauty of a brief but thorough book that gets right to the heart of the mater may be the difference between a book that gets read and one that doesn't. The Secret to Happiness will sow you the keys to the kingdom without bogging you down in theory or forcing you to lug a big, heavy book around. I did not set out to write a dissertation or War and Peace, but a brief, powerful expose' on how anyone can lead a happier life starting within minutes of reading the first chapter! Plus, I am making my happiness book available to you for a fraction of the cost of coaching or counseling session, where you’d receive a happiness assessment, relationship mentoring and counseling about how to attract greater happiness to your life. That would cost a $150 or so . . . whereas my happiness eBook will set you back a fraction of that amount. And, you'll get the Happiness Prescription, all written out for you, to use as a guide and resource in the future. Before life gets in the way, and you forget or get distracted, grab your copy of The Secret to Happiness now. Do yourself a favor and find out what you need to know to maximize the odds that you will design and build the greatest, happiest life you could ever have. I’ve done the work and put it all together for you. And I’ll make it available to you in just seconds through our simple, quick, and painless download system. Just promise me one thing. Promise you’ll play the happiness secrets forward. I encourage you to share the secret to happiness information with others. Your clients and loved ones. Your friends and foes alike. Maybe together we can make a difference in this crazy, old world by letting people know what it really takes to be happy, and why certain things won’t make you happy. A world full of happy people can only be a better world. I guarantee you'll find my book helpful or I'll refund your money. A no risk purchase, picking up your copy of my happiness eBook is a perfectly safe investment, and at less than a fraction of the cost of a counseling session, it's a great bargain. But if you should decide you don't like it, feel free to let us know, and we'll refund your purchase price. But I personally guarantee if you make a sincere effort to apply just two or three techniques in my book, you'll be happier and more content, and you'll be on your way to claiming your share of the peace, love and happiness you've always wanted. Normally, The Secret to Happiness sells for $47. But, you can Get Your Copy Today for . . . Some people just aren't ready to make a change. Maybe they feel they're able to live with their problems a while longer. They may be in the pre-contemplation stage, or the contemplation stage, but they're not ready for action. But, if you want to get started on making your life better right this moment, I've got a some helpful and worthwhile bonuses coming your way . . . bonuses that make The Secret to Happiness even more valuable. When you get your copy of , you'll also receive these gifts, absolutely free. Inside Report on How to Reduce Depression with One Simple Technique: A Unique and Effective Solution. In this report I outline the major reasons people suffer form depression, and the most effective ways and means you can use to prevent depression from stealing away your precious happiness and time. My personal clinical insights are contained in this special report. Inside information garnered from years of clinical practice, and my experiences in working with many depressed individuals and family systems -- some who didn't realize they were depressed. You're not going to find this kind of straight talk about depression anywhere else. Many health care professionals don't even know this stuff. They think depression is a chemical imbalance -- and you have little control over it. So grab your free report and use the information to innoculate yourself against the ravages of depression. Yes, eluding depression is a part of the secret to happiness. Your second bonus is an article on How to Break The Chains of Loneliness and Lead a Happier Life. This is an article that has helped thousands of people. It is the most popular article I've ever written and had published on the internet in many places. People pass it on to others and find the innovative approach I recommend for beating loneliness quite intriguing and helpful. Everyone is prone to loneliness, under the right circumstances. Find out what you can do to prevent and overcome loneliness, one of the biggest obstacles to sustaining a happy life. 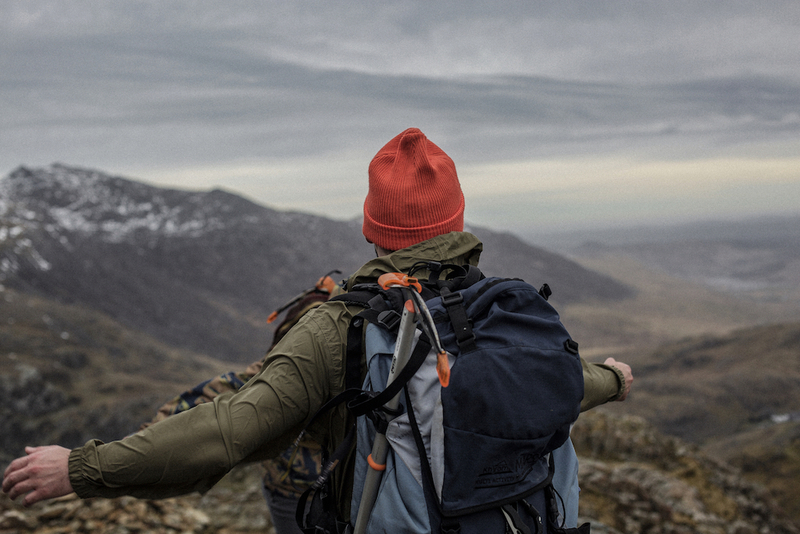 Yes, escaping loneliness is a key component of the secret to happiness. They say the third time is a charm. Well, the third bonus I'm going to offer you is indeed a charm. If you have any relationship issues at all, you'll be interested in this handy Relationship Satisfaction Assessment Tool. It will give you an overview of the quality of your relationship and help you assess your satisfaction with your relationship. Some people wonder if their relationship is a good one or not, and if they should be worried about their relationship problems. Take my Relationship Quiz and discover how your relationship stacks up to your expectations. Keep in mind, it's hard to be happy without good relationships. Use this quiz to gauge all your key relationships. Step back from your relationship and take an objective look. Find out what key areas stand out as problems, so you can address them. It only takes a few minutes to take the quiz and score it. And, yes, the secret to happiness begins with your relationships. Bonus #4 Email mentoring. This is your chance to connect with an experienced psychotherapist who has helped many clients to find the elusive prize of happiness. Got a question about how to be happy, solve a relationship problem or how to find your true calling in life? Just send me an email and ask your question. I will answer with my ideas and any suggestions I may have on how you can overcome and excel. And I'll give you as detailed an answer as I can. What if you still need more help? Give me a quick call and we'll put our heads together to find another way for you to reach your goals and to help you apply the secret to happiness in your life. Thank you for letting me visit with you today. I wish you success in all your endeavors. P.S. 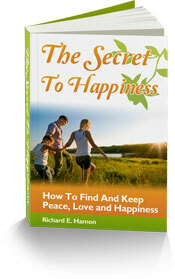 The standard price for The Secret to Happiness is $47, but, I am letting it go for just $24.95, for a short time. Get your copy now, before the price goes back . . . you can download it and start enjoying it within minutes.